I periodically get requests from folks about reading their work and critiquing it or referring them to my agent on the strength of it. Better clear this one up ASAP. I’m going to be blunt, because that’s most helpful here, not because I don’t want to help people become writers, because I blog a lot about doing just that. But reading manuscripts is a much more intimate, involved way of helping, and I haven’t got the spoons. Because why? OK, first of all, single mom. That oughtta be enough to let everyone know I have no time. In case you don’t know any single moms, I’ll go further. Single mom of toddler. Professional writer and single mom of toddler. Also, a person: meaning, I have a strong circle of friends I’m loyal to, and a gloriously complicated love life—and I also study a martial art, and pursue other artistic and volunteer projects, and still need time to relax and stare at books I’ve reread 20 times, all in order to keep myself able to better be…a professional writer and single mom of toddler. Yeah. No time even for those I love, sometimes. So, no, I don’t have the space and energy to read your manuscript. I also won’t refer you to my agent unless I know you personally, like you, believe in your work, and trust you to be good for her to work with. Better to query her directly (don’t use my name unless I say you may, because she’ll check with me and you’ll be out on your ear). This is not about you: this is about keeping a strong working relationship with a truly, truly amazing woman. I hate dashing people’s hopes and saying no, but I’ve had to get good at the latter in order to remain sane. It’s better this way, believe me. Especially if you like my books and want to read more of them. The more time I spend writing, the better, right? Demon Catchers optioned for film! Mia is your average American teenager--she struggles with algebra, doesn't get much attention from boys, and has an overbearing Italian-American dad. 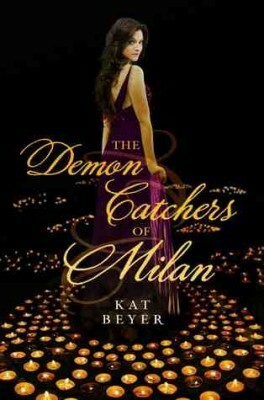 But when a tortured and vengeful demon possesses her, she learns the truth of her family's heritage.